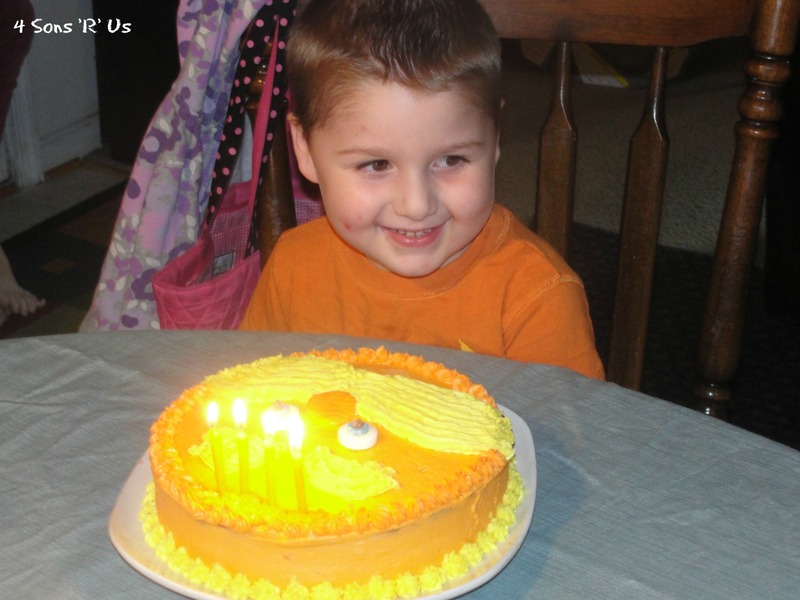 With four boys, you’d think that would mean A LOT of birthday parties. I used to have visions of perfectly planned out, whimsical themed parties. As the kids grew, they pretty much let me know I’d lost a marble or two. I’m lucky if the older boys let me comb their hair on their big day. All totally normal I’m told, but I still don’t have to like it. Do I? That being said, I’m taking full advantage of the youngest son’s obsessive love of things and getting in as many themed birthday’s as I can before I’m stuck with just super heroes, and then nothing but cake, ice cream, pizza, and presents. Since he first got it for Christmas, the youngest son has been in love with The ‘War-ax’. I had flirted with the idea of Toy Story, but as I watch his love of this famous Seuss’ character continue to thrive, logically I knew nothing else would do. That being said, while I enjoy having a ‘theme’ especially one so close to his little heart, I do have four kids and there’s only so much I can do. While I wish I had the time, and energy, and let’s be honest… motivation to throw the super elaborate parties some of my friends do where everything is planned out, coordinated, and theme-centric (virtually down to the tp in the bathroom), I just can’t. Son # 4 walked in, took one look at the few simple treats in store for him, and his face literally lit up. Now, if only I could keep him thinking I’m that cool forever. The Lorax face was made using a pumpkin template that I traced onto construction paper. The pumpkin template can be found here. Orange Hawaiian Punch made his ‘body’. I did have to explain that punch, in this instance, is something you drink and not something you do. The ‘UNLESS’ quote printable can be gotten from A Little Delightful. The I speak for the trees picture was made using lollipop sticks, a sharpie, sparkly pom poms, and a glue gun. 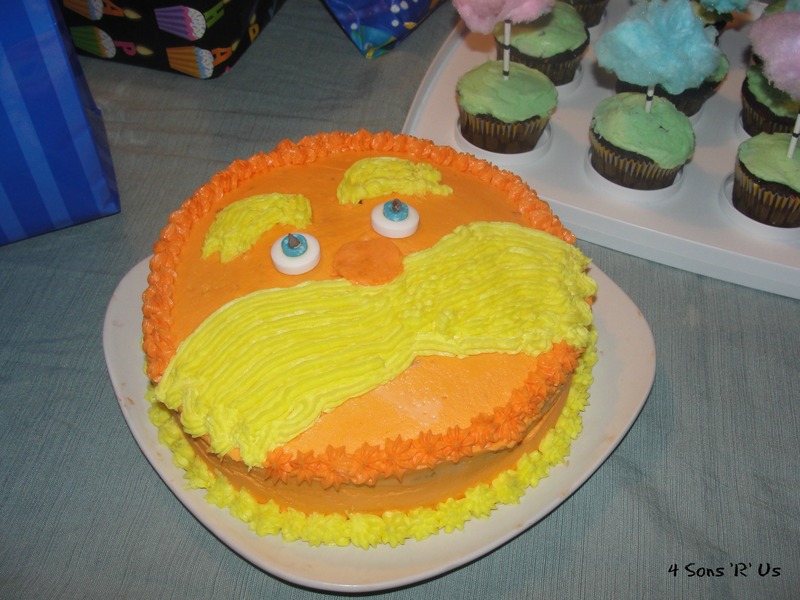 Since my son absolutely loves The Lorax movie, and it’s adorable cast of characters, I knew I wanted to have some themed goodies to snack on. We opted for Teddy Grahams ( as Barbaloots), Goldfish (representing the Humming Fish), Marshmallows (their most favorite treat), and yellow and orange Reese’s Pieces to represent The Lorax himself. Also, to note, when setting out snacks at a party, vases, bowls, glasses and jars all make cute serving dishes. Of course, the youngest son had to have a ‘War-ax’ cake. Again I used the cut out pumpkin template to ‘trace’ the basic outline with a tooth pick. The eyes were made using life savers, smarties, and miniature chocolate chips. 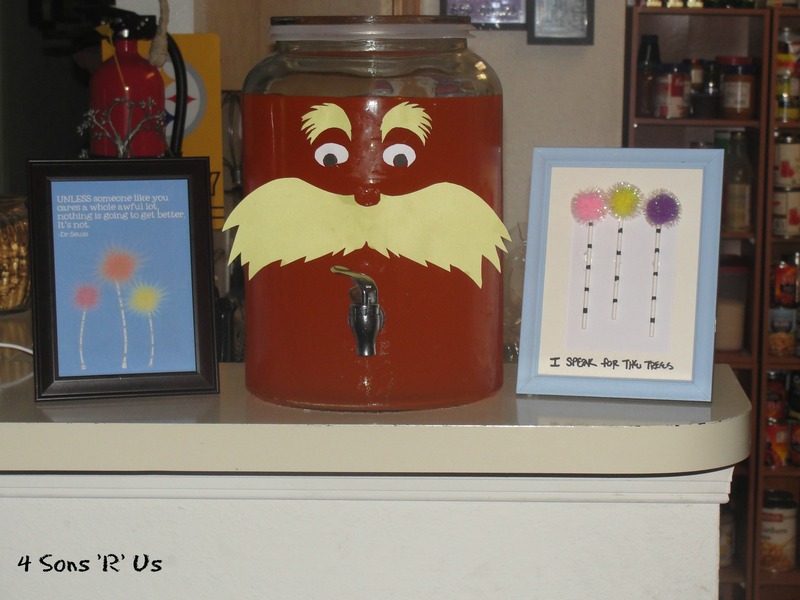 We also made him his very own Truffula tree forest. 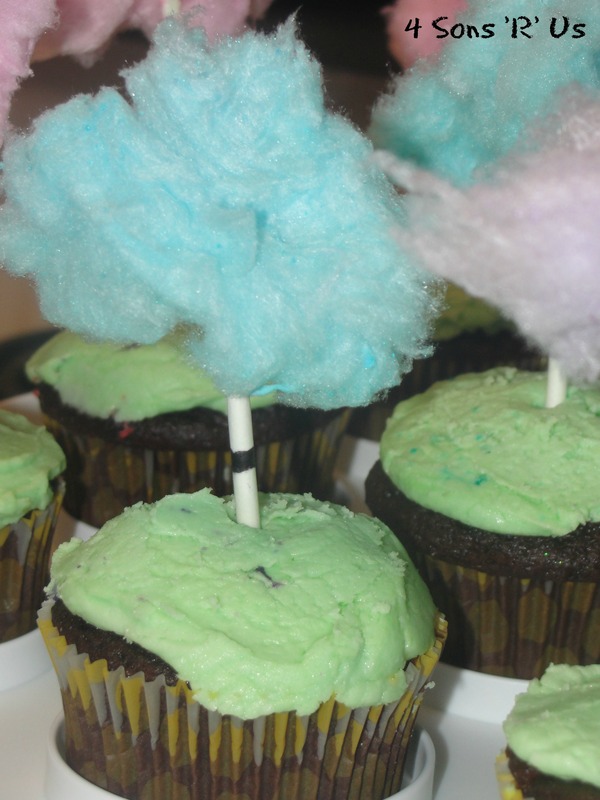 Again, these cupcakes were made using lollipop sticks that I had ‘sharpi-ed’ Truffula bark onto. 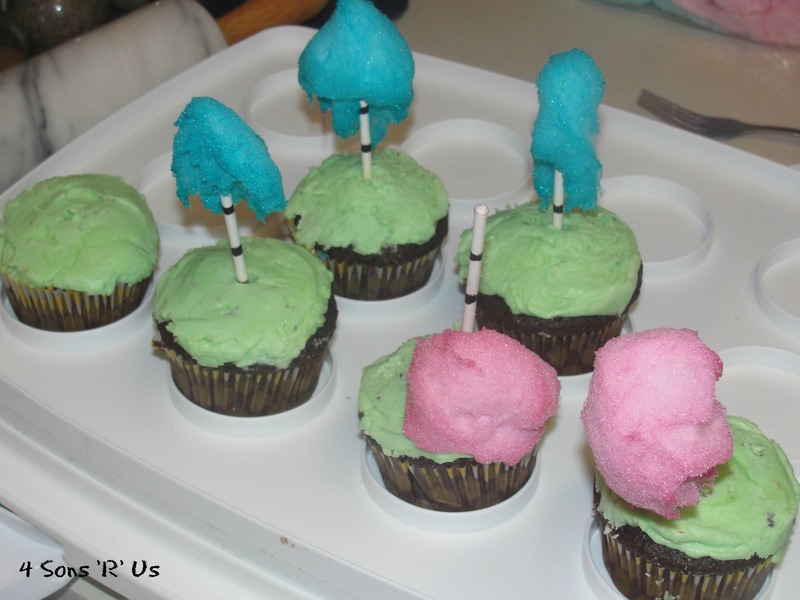 Tufts of cotton candy made the ‘wooly’ bits. While I had seen these cupcakes in several party posts, there was on lesson they all failed to mention that I had to learn the hard way. 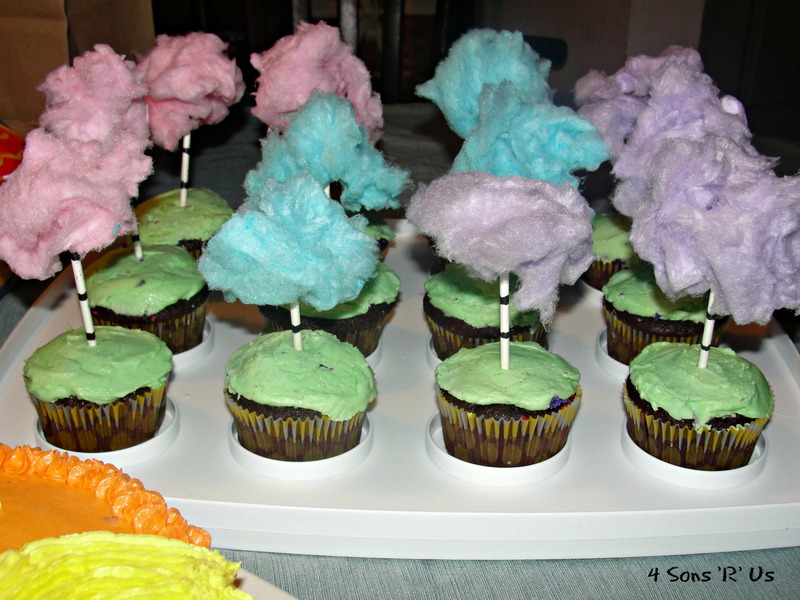 Cotton candy melts, especially in a moist atmosphere. These were what the cupcakes looked like about an hour after being tufted. Pretty depressing, right? I felt a brief wave of panic when I checked on them before I went to bed the night before the party and originally discovered their sorry state. However, I was easily able to re-do the sticks and waited until just before I was ready to serve cake to re-tuft, and they stayed perfectly fluffy up until the moment they were greedily gobbled up. So, son # 4 thought he was pretty much the luckiest little boy in the whole world when he saw his special cake and cupcakes. I know this because he told me so himself the next morning when he borrowed one of my rings and proposed to me. In March my big, bad 12 year old (I’m kidding, he’s an angel) turned an even bigger and badder 13. 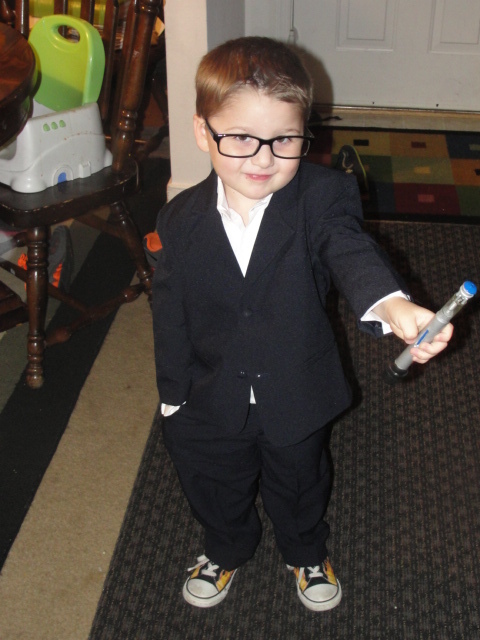 I’m a die-hard Doctor Who fan creating another generation of fan-boys So far all four love the show, but with my 3 year old, and the now 13 year old it’s a love bordering on obsession The 3 year old refused to be anything other than THE Doctor for Halloween, and my birthday boys entire wishlist was related to the show. I had found this really awesome Thor hammer on clearance at Target and just knew he’d love a Thor cake (he’s a fan-boy he loves comic books), but I was wrong. Nothing but a Doctor Who themed cake would do. The result was a lovely Tardis cake, and he was happy and impressed! 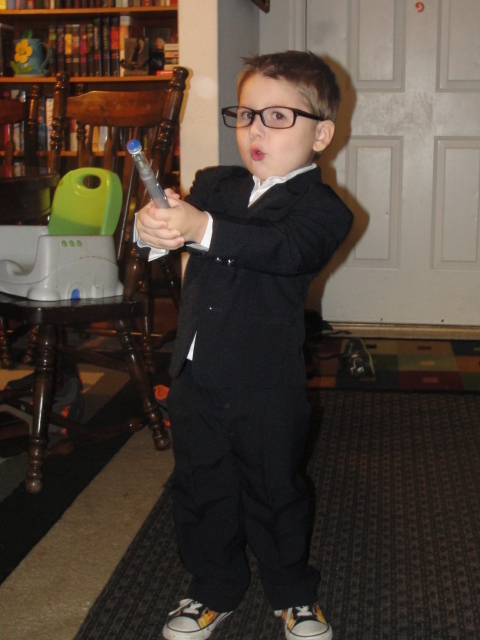 My little Wholigan with 10’s customary blue suit, converse sneakers, glasses, and of course his sonic screwdriver (built by my wonderful husband). I simply cut the Tardis shape out of a sheet cake. Frosted the whole cake blue. Piped on the doors and fake windows. The top two windows are squares of white chocolate. I used a toothpick to poke out an outline for Police Box and then traced with white icing. In anticipation of the premiere of the second half of season 7 of the show, I decided that since it was such an exciting night in our house, I’d make some coordinating treats to add to the anticipation. While we watched the premiere episode, ‘The Bells of St John,’ the kids munched on slices of Fish Finger and Custard Pie (which was actually a basic ‘dirt’ cake with a few changes made) and mini Adipose. In a food processor, chop the cookies until no chunks remain and the white cream has disappeared. Transfer cookie crumbs to a separate bowl. In the food processor, combine butter, cream cheese, and sugar until evenly combined. In a separate bowl, evenly combine milk and whipped topping. Add milk mixture to the food processor and pulse until evenly combined. Pour ‘custard’ into a pie pan. 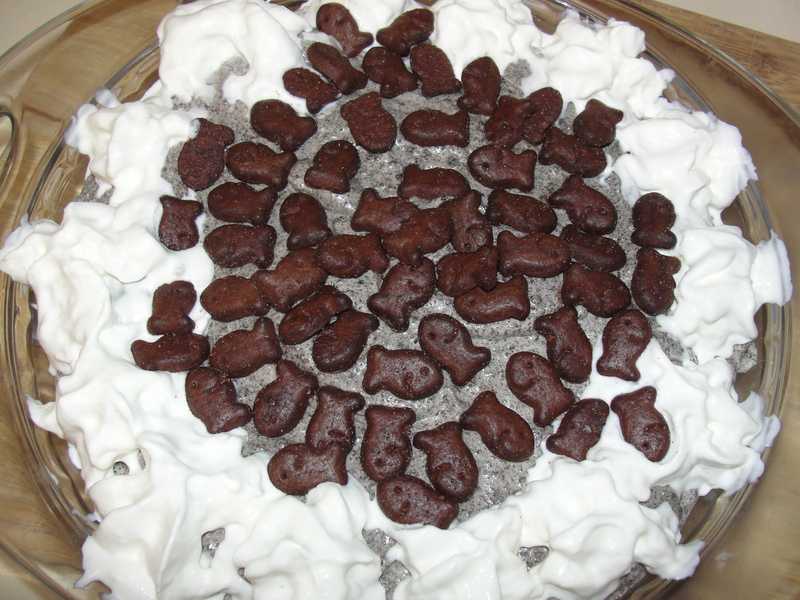 Top with ‘fish fingers’ and dollops of whipped cream. Warning: Unlike me, be sure to warn your child that a ‘dirt’ cake doesn’t actually contain dirt. Otherwise they might refuse to eat it and wonder why on earth you would ever willingly feed them dirt. Make a ‘glue’ by creating a paste of confectioners sugar and water. Keep adding confectioners sugar to a little bit of water until the mixture has the texture of paste. One at a time, add paste to one end of a mini marshmallow and hold onto a large marshmallow for a few second, until stuck. Repeat until you’ve created two arms and two legs. 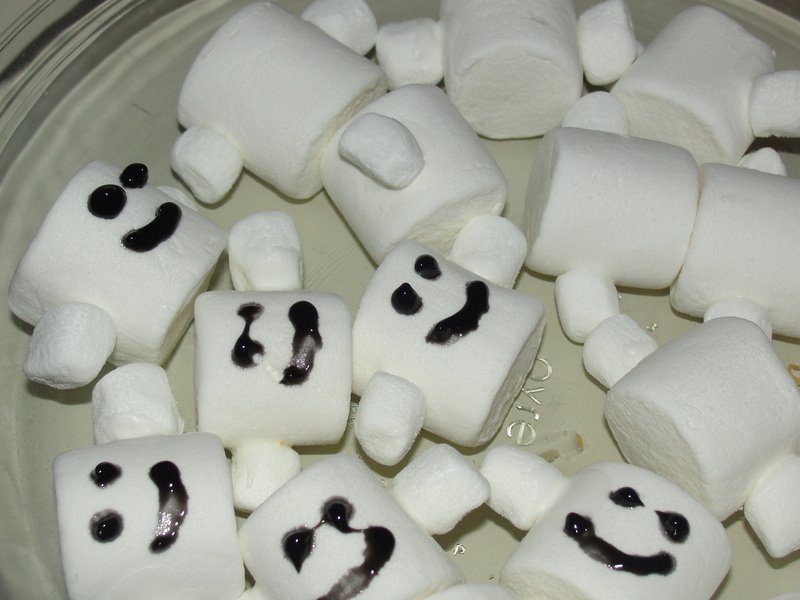 Once you’ve created the desired number of bodies, draw eyes and a smile on with the black icing gel. These treats would also be great for an end of the season party or even to celebrate the 50th Anniversary special! 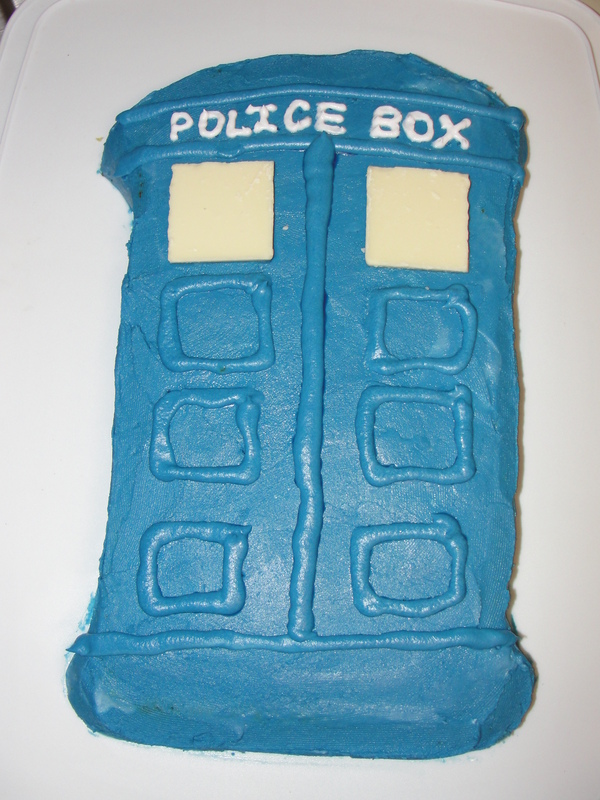 What Whovian, young or old, wouldn’t go ga-ga over themed treats during an episode? !